The Provider A/R Totals Report can indicate how effective your collection efforts are. This report displays total accounts receivable, total production, total collections, and a ratio (%) of collections to production. The report can also include unapplied credits. You should run this report and review it with your staff at least once a month (some consultants even suggest running it weekly). On the Home menu, under Reports, click (or tap) Provider A/R Totals. The Provider A/R Totals page opens. 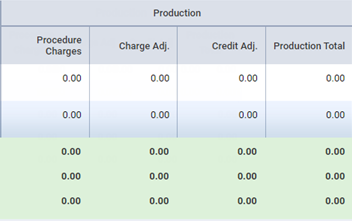 Select the All check box to include totals for transactions in all locations in the organization. Or, clear the check box to not include totals for transactions in any location in the organization. Select or clear the check box next to the current location name to include or to not include the totals for transactions in that location. Click (or tap) Select Locations to select or deselect locations. Date Range - The date or date range of transactions to include on the report. Leave the current date selected, or select the desired date (today or a specific date) or date range (previous week, previous month, previous quarter, previous six months, previous calendar year, or a custom range). 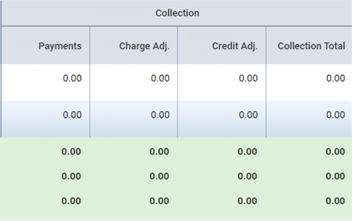 Applied Date - To include totals for transactions according to the date when payments, credit adjustments, and/or unallocated credits were applied to charges. 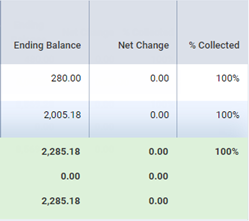 Created Date - To include totals for transactions according to the date when payments, credit adjustments, and/or unallocated credits were entered (when the ledger entries were added to the database). 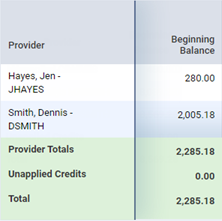 Provider - The provider totals to include on the report. 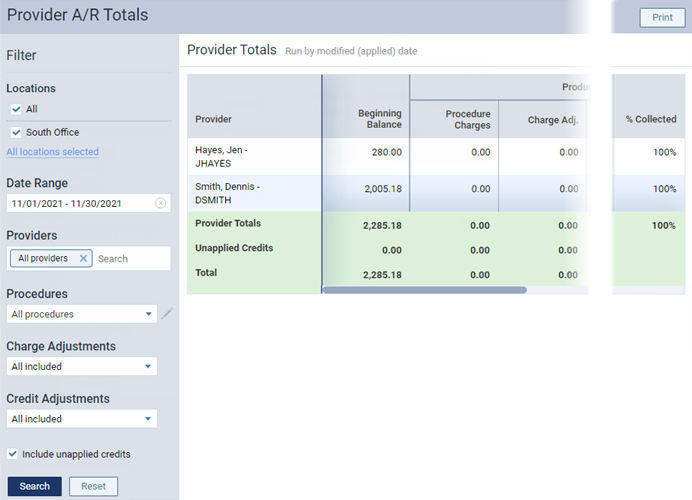 Select whether you want the report to display totals for all providers or a specific provider. Locations and business entities that have been set up as billing providers are also available for selection. Include Unapplied Credits - Select whether you want the report to display unapplied credits or not. The report appears according to the specified filters. The report consists of the following sections.